Win or lose it's somewhat nice to know that recent Mossley games have a theme running through them: late drama and a result decided by just the odd goal. The latest addition to this particular motif being a goal scored two minutes from time which condemned the Lilywhites to a 2-1 defeat at Lancaster City's Giant Axe ground. Losing so late on to a team at the top of the division doesn't sound too shabby but there is disappointment as, apparently, we were the better side for long stretches of the match and well worthy of something more than the zero points we got. Alas, the record books only keep tabs on the actual result and not what it should have been, so Lancaster move three points closer to the title and Mossley remain comfortably in the mid-section of the league table. Once again the use of the word beginning with 'app' in the last paragraph should give you a clue (and a big one too) that I wasn't at this match which means I can't give you the specific ins and outs. Therefore if you want to know what what went on I suggest going here or here. However, if you want to know what the new Alice in Wonderland film is like, I can give an opinion on that: it isn't good. Erm... well, we lost. That seven game unbeaten run we were on? Came to an end at the ironically named Victory Park. Or if you're a Chorley supporter the appropriately named yada, yada, yada*. Actually I've no idea what went on at all over the course of this particular ninety minutes plus as I was sat 35 miles away being repeatedly and comprehensively beaten on Call of Duty: Modern Warfare 2 by a succession of our European cousins - something I'm going blame on the bad back I was suffering from at the time rather than any lack of skill on my part. Right! Apparently we went one up very early on in the match through Andy Watson, a goal which by all accounts was against the run of play. The Magpies equalised later on in the half as Lee Shillito became the latest in the ever growing line of ex-Mossley players to find the net against us. And that's how the score remained until eight minutes from time when Danny Lloyd-McGoldrick put the home side in front and Chris Amadi increased the lead further. The Lilywhites managed to find the net once more but for the first time in a while a Mossley goal scored in injury time didn't have any effect on the outcome of the match. Hang on! Why did I just I write all that when you could have read it for yourself here like I did? * Yes, Seinfeld references on this very blog! Don't know why though because <heresy> I'm not a great fan of the programme </heresy>. Regular readers (see how I'm being unusually optimistic by using the plural) will know that the reports on the blog are the official ones with a few added extras - such as the odd, toe curlingly bad gag, a tortured metaphor or two and the occasional expression of an opinion that no one agrees with. Sometimes though the report on here carries none of those of things and is simply just a straight copy of the one which appears on the official site, in the programme and, every now and again, in the local paper too. There's a perfectly good reason for this... well, now I come to think of it there's actually two. The first is pure, unadulterated, wanting to spend my Sunday's doing something better laziness. The second though, and the reason that's pertinent on this occasion, is because there's simply nothing to write about; at least nothing to expound on in greater and more elaborate detail. What's in the official report is the entirety of what took place barring the omission of a couple of chances that you'd be hard pushed to affix the label of 'half' too.I know, it seems incredible that a game containing five goals could be so incident free but that was the case. After an injury time equaliser at Trafford had brought their run of five successive victories to an end in midweek, Mossley embarked on what they no doubt hope will be another lengthy run of positive results with a win against Harrogate Railway Athletic at a rain sodden Seel Park. Despite their lowly position in the league, any assumptions that this would be an 'easy' fixture for the Lilywhites were countered by the fact that Harrogate entered the match as one of the in-form sides in the Unibond First Division North having taken 13 out of a possible 15 points, including a defeat of current league leaders Lancaster City. And if there were any lingering thoughts that it would be a relatively trouble free afternoon for the Mossley, who themselves were on a similar vein of form, they were dispelled in an opening thirteen minute spell that the visitors dominated and in which they took a deserved lead. The impressive Ben Jones fed the ball into the path of Kevin Ryan and after shrugging off the attentions of Graham Kay, the burly Harrogate striker fired the ball low across Peter Collinge and into the corner of the net. It was a lead that didn't last long though as less than two minutes later, and on what was practically their first attack, Chris McDonagh netted from close range to pull Mossley level; the forward taking advantage of some leaden footed defending to ghost into the box and onto the end of Steve Settle's inch perfect through ball. McDonagh and Matty Kay both had opportunities to edge the home side in front before Steve Moore did just that eight minutes from the break. A weak punch by ex-Mossley keeper James Mann following a goalmouth scramble fell to the feet of Moore on the edge of the penalty area and his first time strike flew through a crowd of players and across the line. The goal helped to calm a few nerves as Mossley could have easily found themselves playing catch-up again just two minutes before Moore's strike. Fortunately Aaron Hollingdrake was unable to punish the lax defending that saw him with the ball at his feet and only the goalkeeper to beat by firing horribly wide of the upright from ten yards out. Unsurprisingly the combined effects of the weather and the energy sapping nature of the heavy pitch began to take its toll on the players and, as a consequence, the entertainment value of the match too. Tired limbs led to a succession of mistakes and it was through one that Mossley gave a cushion to their lead in the 63rd minute. A long clearance down field should have been dealt with easily by Harrogate centre half Grogan but his mis-control allowed McDonagh to take possession. The ball then worked it's way across the 18 yard box via the boot of Matty Kay to Moore who launched a rocket of a shot into the net off the underside of the crossbar. The loss of Jones through injury appeared to bring to an end the visitors best hope of fashioning a comeback and Mossley looked to be cruising to a comfortable three points. At least that was the case until Ryan scored his second of the afternoon with two minutes of the match remaining, giving the Lilywhites a slightly more nervous end to the game than they were expecting as Athletic pushed men forward in search of an equaliser. Their defence however wasn't to be breached for a third time and the Lilywhites kept their lead intact to register a sixth win in seven outings, move themselves into ninth spot in the table and with the number of games they have in hand on the teams above them, spark faint hopes of possible push for a play-off spot. Well some people think there's an outside chance of spot in the top five come the end of the season. I very much doubt we'll get there but stranger things have happened. I mean, in the middle of December who'd have thought we'd ever be as high as ninth? Or scoring more than one goal a game in the league? Then again, who'd have thought we'd have no floodlights and be playing some home games at Ashton United? If you did, what lottery numbers have you got for next week? I've been brought up to believe that if you can't say something nice then you shouldn't say anything at all. Good manners which mean I won't be giving a critical appraisal of the referee in this game (at least that is what he was supposed to be) or a certain ex-Mossley midfielder. At least I'm not going to try to mention them but I feel that may be an impossibility. Okay then, I'll get it out of the way now. The match official: staggeringly bad. From the moment he only gave Mr X (I'm going to give him the satisfaction of having to write his name) a yellow card for a shocking tackle on Ben Richardson he began the descent of a slippery slope. The booking of Chris McDonagh for a challenge in which a goalkeeper and defender collided with one another a yard and a half in front of him being a 'highlight' of the countless other ridiculous decisions that grew in number as the match progressed. As for Mr X... I didn't think my opinion of him could get much lower. The tackle that nearly broke Richardson's leg last week at Radcliffe was late but this one came after play had moved ten yards up the pitch and was the catalyst for all the unpleasantness on the night. To make matters worse the challenge was from behind giving Richardson no chance to get out of the way, the whole thing was then compounded by X standing low over the injured player and snarling at him ala 'Keane on Haaland'. A cheap shot from a player who despite trying to come across as a hard man is nothing than a coward, further evidence of which can be found in his post game behaviour which is detailed here. But what about the match itself? Well there wasn't really much difference between it and the last game against Ossett. Like Saturday's game Mossley seemed to switch off after quarter of an hour, only this time with a two goal lead courtesy of Chris McDonagh and some very nice approach play. Again mirroring the weekends fixture, Mossley only switched back on after the opposition had drawn level early in the second half and proceeded to create chance after chance and, sadly, miss chance after chance. One finally went in with ten minutes to go - Chris McDonagh completing a thoroughly deserved hat-trick - and with more chances going begging, the result seemed done and dusted. At least it would have done if Trafford hadn't turned into a set of tumbling clowns around the penalty box - it was almost as if they were auditioning for a spot with the Cirque du Soleil currently in residence at the shrine to Mammon a mile up the road from the ground. I swear that every time the ball got near the area at least two players would hit the deck and the referee, being ever so eager to please his hosts, would award them a free-kick. Two minutes into injury time they got their final free-kick of the match and equalised, at which point we were treated to the sight of the goalscorer shunning his team mates to run to the opposite end of the pitch to give the supporters behind the Trafford goal the finger and unleash some words at them that I won't put on here. What was the referee doing while this was happening? I've no idea, I wasn't watching. For all I know he could have been celebrating with the rest of the Trafford players. Before the game I'd have been happy with a draw. When Trafford drew level I'd have been happy with a draw. So I suppose I should be happy with the final 3-3 outcome. Well maybe not that happy considering we should have had the game won long before the end and that we fell foul of an injury time goal courtesy of yet another nonsensical decision from the man in charge. But then that has always the case on our trips to Shawe View. You know that a) no matter how well we play we're never going to win, b) the referee is going to be bad and c) so his assistant running the line in the top end half of the pitch - it's one of life's unwavering constants. Another game, another win. Four words (or technically just three) that more or less sum up everything about this game. It wasn't a classic and it wasn't much of a contest either. For the fourth time in five games a goal from Lee Blackshaw turned out to be the decisive moment in a Mossley match as not even the disadvantage of playing for almost an hour with ten men could stop the Lilywhites from recording their fifth successive victory. The home side took a 6th minute lead when centre half Graham Kay found himself in the unusual position of being the furthest man forward in a Mossley attack. Some patient build-up play from Ben Richardson and Jordan Goodeve found a perfectly timed run into the box by Chris McDonagh and his low cross was met by Kay who stooped to head the ball home. At this point Mossley looked like scoring every time they ventured forward and when Blackshaw was hauled to the ground inside the penalty area in the 12th minute, they were awarded the opportunity increase their lead from the spot. Unfortunately for the Lilywhites Steve Moore's effort from twelve yards wasn't the best penalty he's ever taken and Ben Saynor was able to make a good, if somewhat comfortable, save. A description which can also be used for his stop to deny Michael Fish with a follow up shot. The miss appeared to take the wind out of Mossley's sails and for the remainder of the half they struggled to rediscover the form that, with some better finishing, could have seen them end the game as a contest within the opening quarter of an hour. Admittedly their cause wasn't helped when Kay was shown a straight red card for retaliating to a dangerous looking challenge from Shane Kelsey but it didn't hinder them either as, barring one good claim for a penalty when Nathan James was bundled over by keeper Peter Collinge, Ossett failed to pose any kind of threat to the numerically challenged home side in the first period. The second half started with Michael Fish and McDonagh both going close to doubling an advantage that was eventually, and surprisingly, cancelled out in the 57th minute. A mini period of pressure which began with Kelsey hitting the upright from a free-kick ended with Andy Brownrigg heading past Collinge following a dead ball kick taken in almost exactly the same spot. Rather than being a catalyst for the Yorkshire side to go forward in search of a winner though, the equaliser re-galvanized Mossley and ten minutes later they were back in front; substitute Steve Settle's low ball across the six yard box having been directed into the net by Blackshaw. A third and fourth goal went agonisingly close to being added over the next two minutes as Richardson fired narrowly wide of an upright that Settle hit moments later with a venomous shot. At this stage you began to wonder which side had actually been reduced in number as Mossley continued to press forward in search of more goals. McDonagh missed a golden opportunity to have sealed the win when he hit the crossbar from only two yards out ('golden opportunity' of course being match report speak for 'an absolute sitter') and Saynor produced a good recovering save after his handling error almost presented Nathan Neequaye with a similarly gilt edged chance. The match reached its conclusion with the Lilywhites only having to endure one minor scare before they could claim a deserved win against their lacklustre opponents. And yes, I do understand the irony of me describing Albion with the L-word when its an adjective that's can equally applicable to this match report. The problem is that it's hard to convey drama when there was none. Yes, we had a player sent off and yes, they eventually equalised but there was never any feeling that Mossley would lose this. To be brutally honest, I doubt it's a feeling that would have changed had we had another player or two dismissed because Ossett were woeful. Painfully so. All told there's not much more else that can be said. A good display from Mossley, another win and that's about it. 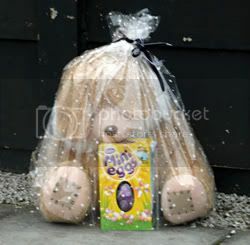 The only other thing worth mentioning is the half-time raffle prize which in a break from the usual bottle of whiskey or wine turned out to be a giant stuffed bunny rabbit. Seriously. It still doesn't surpass the current holder of football's most bizarre raffle top prize though: an emergency car breakdown signal/torch which was the reward for having the winning ticket at Newcastle Town one late December around ten years ago - the phrase 'unwanted Christmas gift' springing immediately to mind. Never before or since has the outlay of a pound coin ever produced something so underwhelming in return. Apart from maybe the Sunday Express. So its come to this: writing about raffle prizes. That probably is the sound of a barrel being scraped you can hear. In case you didn't know, Google have now updated the Streetview option on their Maps site to include all but a small percentage of the UK's roads, avenues, lanes and... er, streets. This means that if you so wish you can now go for a virtual walk around Mossley from the comfort of your own armchair. Of course you won't be able to experience the sounds and smells but that's just another upside isn't it? Not only that but my brother is on there too. If you find anything else of interest while looking around Mossley (or anywhere else that's local) on Streetview, do let me know and I'll put a link to it on here. By rights this report should consist solely of me wittering on in an overly ebullient fashion about the latest instalment in Mossley's winning streak; filled as it was with some superb passages of football. Unfortunately though it's not going to be because my powers of description have failed me. I'd love to be able to tell you about a three man move midway through the first half involving Nick Allen, Steve Moore and Chris McDonagh but I don't possess a vocabulary that could do it justice. And the same thing goes for a whole host of moments like these during the match, including a great spell of 'keep ball' around the Radcliffe box which wound down the clock in injury time. Either that or I'm just feeling really lazy when it comes to writing reports these days. Whatever the reason is though one thing is a fact: a solitary goal from Matty Kay proved to be enough to earn Mossley their fourth consecutive victory in a fixture that wasn't as close as maybe the score line suggests. Considering the Lilywhites recent tendency for clinching wins with virtually the last kick of the match, this particular game winning goal came at the relatively early time of the 18th minute. A long punt upfield by Peter Collinge was gifted to Kay by the head of one of Borough's centre halves and after taking one touch to control the ball, the Mossley midfielder unleashed a drive from 25 yards that flashed past Lloyd Rigby (no relation) in the home sides goal and into the bottom left hand corner of the net. Even at this youthful stage of the game it was no more than the visitors deserved for the pressure they were putting their hosts under. The only thing that stops that period of pressure being labelled as constant was a moment in the 9th minute in which Ben Wharton, a former Mossley trialist, crashed a shot against the crossbar following a mazy run towards the edge of the visitors box. After going a goal behind Radcliffe began to struggle to contain their opponents attacks and it was a task made all the harder just before the half hour when Ben Manning was shown a red card for an horrifically late two footed lunge on Ben Richardson. It was an atrocious challenge and one that could have easily cast an extremely dark and disturbing cloud over proceedings had the Mossley wing back not had the leg which was clattered into off the ground. If that wasn't bad enough what followed really took the shine off the game as the behaviour of quite a few people from Radcliffe after that, for want of a better word, 'tackle' leaves a heck of a lot to be desired. There are tales doing the rounds too of an even more senior official at Borough behaving like a complete muppet in the aftermath of the incident. If they're true, and I've no reason to doubt the source of these claims, then the person in question should perhaps make good with his tiresome annual threats to pack in with football and do the game a favour. Seriously, the attitude of some people in this sport beggars belief and it's fools like these: people who can scream abuse at someone for having the temerity not to stand still and have his leg broken, that make me wonder if the game is really worth bothering with. In an attempt to press home their advantage and capitalise on the disorganisation in the Borough defence caused by the dismissal, Mossley mounted attack after attack in search of the goal or goals that would seal the win. Steven Moore brought an excellent save of Rigby with a stinging thirty yard shot and then saw another effort bounce off the upright. His strike partner Chris McDonagh went close to doubling the lead with an angled drive, as did Lee Blackshaw and Kay again, while Andy Russell's point blank header from a corner looped over the crossbar after hitting a motionless and somewhat stunned Rigby in the face. Mossley continued to press forward after the interval with both Russell and Blackshaw again narrowly failing to add to the lead. The longer the game wore on though, the more the visitors became content to sit back and defend the advantage they held; the consequence of which being that Radcliffe began to enjoy a greater share of possession as they pushed forward in search of an equaliser. I will admit that there were more than a few jitters amongst the travelling contingent in the closing moments of the match as the ball pinged around the edge of the Mossley box. Having a one goal lead with a few minutes will do that to any supporter. To be honest though, there's not a lead imaginable that Mossley fans would ever be comfortable with. Even at four or five goal goals up with seconds to play the average Lilywhites follower would at most expect a draw. Some call it pessimism, others call it negativity - the rest of us call it 'been there, done that'. But looking back at those moments now in the (very) cold light of day you realise that the nerves and panicked cries of “clear it” were unnecessary because then men in white were really quite comfortable; the solidity of the Lilywhites back line meant that Borough's attempts to salvage the game were confined to nothing more than pot shots from a distance. While the margin of victory may not accurately reflect Mossley's hold on the game, the three points gained from this latest success does move them a step closer to a top ten spot in the league – something which I doubt many, including the most ardent Lilywhites fans, would have thought possible given the position the club was in a little over a month ago. Whenever history chooses to repeat itself at Mossley, be it on or off the pitch, it's not a good thing. Brows are furrowed, hatches are battened and the gulps of worry and sighs of despair are loud and many. Occasionally though, just occasionally mind, fate decides to give us a break from reminding us of financial woes and sloppy defending from times gone past to prompt us into recalling one of those few good times that reside in the annals. Usually though it's something that happened a bit longer than seven days ago. Not that you'll find anyone from Mossley complaining about the repetition of 'still fresh' events as for the second time in a week Lee Blackshaw was in the right place at the right time to score a last minute winner for the Lilywhites in West Yorkshire. Details of this victory at Wakefield's College Grove ground (Mossley's third win in eight days and the third time in a row that they've come back from a losing position to do it) can be found on Mossleyweb or here as my presence was elsewhere on this particular afternoon - yes, another Mossley80 no show at a game I'm afraid. I could if I wanted to choose to fill the gap where a report on the Wakefield game should be by bringing you my thoughts on the Glossop North End versus Padiham game I saw in midweek. However, as it was a game that came close to putting the final into the coffin in which my love of football currently resides, I have no wish to relive it. Don't let the 2-2 score line, a sending off and a last minute equaliser fool you - it was an awful game. It's hard to pinpoint what the worst part it was given there were so many bad things to choose from. There was the football, the cold, the football, the abuse a female assistant referee got despite the fact she got practically all her decisions right, the football and, oh, have I mentioned that the football was bad? The fevered talk on the terraces before kick-off was that Glossop had chosen to give New Mills a four figure sum for striker Gary Kharas. And on the basis of this particular performance, if those four figures are anything more than £10.01, North End have been ripped off. Then again I doubt his confidence will have been helped by the critique he got from a New Mills official on High Peaks Radio which was broadcast over the ground's PA system as he went about his pre-game warm up. The idea to play the stations sports coverage over the tannoy is a good one but when somebody starts to intimate that your new signing has basically lost it, it may be an idea to actually turn it off. Back to Mossley though as this after all is a blog about they. Next up for the Lilywhites is a trip to Stainton Park to face Radcliffe Borough who are in the rather unusual position of being in the top half of the table in March; a situation that means the visitors are going to have to be on their mettle to keep their winning streak going and overcome the previously perennial strugglers. 91st most important game of the week! Or to you and I, Bamber Bridge vs Mossley. If you're like me and haven't travelled up to Preston for this match (and judging by the number of people loitering on the forum as I'm writing this, there's a heck of a lot of you), you can keep up-to-date with events at Ironbridge by clicking on the following link which will take you to Brig Cast - a live match update service for Bamber Bridge's games. Here you'll be able to read about the goals (either the plethora or lack of them), substitutions, general musings on the game and the occasional random comment from other readers. It'll be just like being there... except warmer, cheaper and you won't have as far to drive home if we lose.